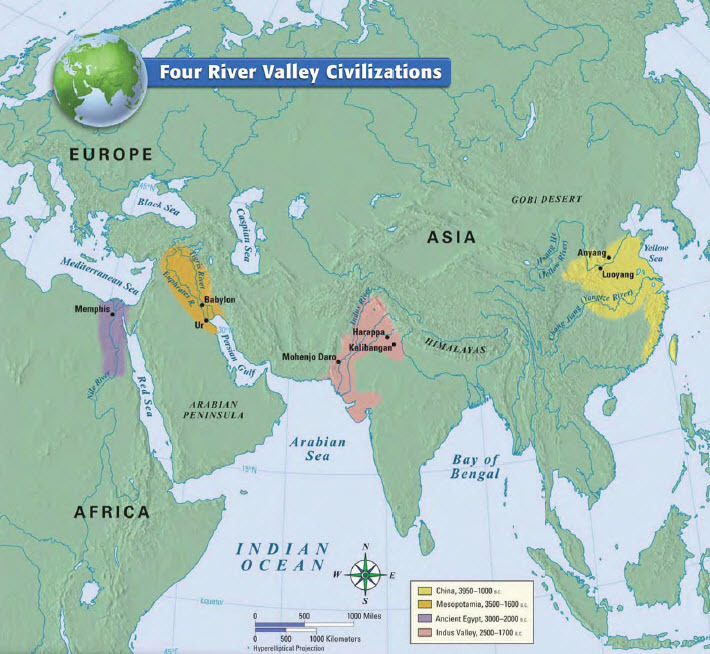 Early River Valley Civilizations, 3500 B.C.–450 B.C. SETTING THE STAGE Two rivers flow from the mountains of what is now Turkey, down through Syria and Iraq, and finally to the Persian Gulf. Over six thousand years ago, the waters of these rivers provided the lifeblood that allowed the formation of farming settlements. These grew into villages and then cities. The rivers framing Mesopotamia are the Tigris (TY•grihs) and Euphrates (yoo•FRAY•teez). They flow southeastward to the Persian Gulf. The Tigris and Euphrates rivers flooded Mesopotamia at least once a year. As the floodwater receded, it left a thick bed of mud called silt. Farmers planted grain in this rich, new soil and irrigated the fields with river water. The results were large quantities of wheat and barley at harvest time. The surpluses from their harvests allowed villages to grow. Environmental Challenges People first began to settle and farm the flat, swampy lands in southern Mesopotamia before 4500 B.C. Around 3300 B.C., the people called the Sumerians, whom you read about in Chapter 1, arrived on the scene. Good soil was the advantage that attracted these settlers. However, there were three disadvantages to their new environment. Unpredictable flooding combined with a period of little or no rain. The land sometimes became almost a desert. With no natural barriers for protection, a Sumerian village was nearly defenseless. The natural resources of Sumer were limited. Building materials and other necessary items were scarce. Solving Problems Through Organization Over a long period of time, the people of Sumer created solutions to deal with these problems. To provide water, they dug irrigation ditches that carried river water to their fields and allowed them to produce a surplus of crops. For defense, they built city walls with mud bricks. Sumerians traded their grain, cloth, and crafted tools with the peoples of the mountains and the desert. In exchange, they received raw materials such as stone, wood, and metal. These activities required organization, cooperation, and leadership. It took many people working together, for example, for the Sumerians to construct their large irrigation systems. Leaders were needed to plan the projects and supervise the digging. These projects also created a need for laws to settle disputes over how land and water would be distributed. These leaders and laws were the beginning of organized government—and eventually of civilization. The Sumerians stand out in history as one of the first groups of people to form a civilization. The five key characteristics set Sumer apart from earlier human societies: (1) advanced cities, (2) specialized workers, (3) complex institutions, (4) record keeping, and (5) improved technology. All the later peoples who lived in this region of the world built upon the innovations of Sumerian civilization. land it controlled formed a city-state. A city-state functioned much as an independent country does today. Sumerian city-states included Uruk, Kish, Lagash, Umma, and Ur. As in Ur, the center of all Sumerian cities was the walled temple with a ziggurat in the middle. There the priests and rulers appealed to the gods for the well-being of the city-state. Priests and Rulers Share Control Sumer’s earliest governments were controlled by the temple priests. The farmers believed that the success of their crops depended upon the blessings of the gods, and the priests acted as go-betweens with the gods. In addition to being a place of worship, the ziggurat was like a city hall. From the ziggurat the priests managed the irrigation system. Priests demanded a portion of every farmer’s crop as taxes. cities became more and more frequent. Gradually, Sumerian priests and people gave commanders permanent control of standing armies. many Sumerian city-states came under the rule of dynasties. The Spread of Cities Sumer’s city-states grew prosperous from the surplus food produced on their farms. These surpluses allowed Sumerians to increase long-distance trade, exchanging the extra food and other goods for items they needed. 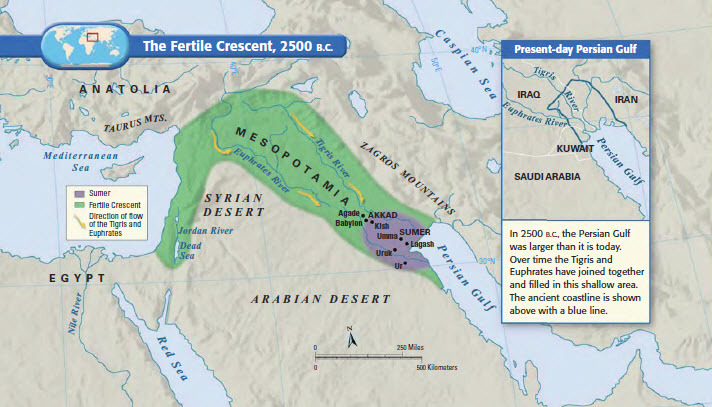 By 2500 B.C., new cities were arising all over the Fertile Crescent, in what is now Syria, northern Iraq, and Turkey. Sumerians exchanged products and ideas, such as living in cities, with neighboring cultures. This process in which a new idea or a product spreads from one culture to another is called cultural diffusion. The belief systems, social structure, technology, and arts of the Sumerians reflected their civilization’s triumph over its dry and harsh environment. A Religion of Many Gods Like many peoples in the Fertile Crescent, the Sumerians believed that many different gods controlled the various forces in nature. The belief in more than one god is called polytheism (PAHL•ee•thee•IHZ•uhm). Enlil, the god of storms and air, was among the most powerful gods. Sumerians feared him as “the raging flood that has no rival.” Demons known as Ugallu protected humans from the evil demons who caused disease, misfortune, and misery. Sumerians described their gods as doing many of the same things humans do—falling in love, having children, quarreling, and so on. Yet the Sumerians also believed that their gods were both immortal and all-powerful. Humans were nothing but their servants. At any moment, the mighty anger of the gods might strike, sending a fire, a flood, or an enemy to destroy a city. To keep the gods happy, the Sumerians built impressive ziggurats for them and offered rich sacrifices of animals, food, and wine. Some of the richest accounts of Mesopotamian myths and legends appear in a long poem called the Epic of Gilgamesh. Sumerian people worked with their hands in fields and workshops. At the lowest level of Sumerian society were the slaves. Some slaves were foreigners who had been captured in war. Others were Sumerians who had been sold into slavery as children to pay the debts of their poor parents. Debt slaves could hope to eventually buy their freedom. Social class affected the lives of both men and women. Sumerian women could work as merchants, farmers, or artisans. They could hold property in their own names. Women could also join the priesthood. Some upper-class women did learn to read and write, though Sumer’s written records mention few female scribes. However, Sumerian women had more rights than women in many later civilizations. Sumerian Science and Technology Historians believe that Sumerians invented the wheel, the sail, and the plow and that they were among the first to use bronze. Many new ideas and inventions arose from the Sumerians’ practical needs. Arithmetic and geometry In order to erect city walls and buildings, plan irrigation systems, and survey flooded fields, Sumerians needed arithmetic and geometry. They developed a number system in base 60, from which stem the modern units for measuring time (60 seconds = 1 minute) and the 360 degrees of a circle. Architectural innovations Arches, columns, ramps, and the pyramid shaped the design of the ziggurat and permanently influenced Mesopotamian civilization. Cuneiform Sumerians created a system of writing. One of the first known maps was made on a clay tablet in about 2300 B.C. Other tablets contain some of the oldest written records of scientific investigations in the areas of astronomy, chemistry, and medicine. From 3000 to 2000 B.C., the city-states of Sumer were almost constantly at war with one another. The weakened city-states could no longer ward off attacks from the peoples of the surrounding deserts and hills. Although the Sumerians never recovered from the attacks on their cities, their civilization did not die. Succeeding sets of rulers adapted the basic ideas of Sumerian culture to meet their own needs. Sargon of Akkad About 2350 B.C., a conqueror named Sargon defeated the city-states of Sumer. Sargon led his army from Akkad (AK•ad), a city-state north of Sumer. The Akkadians had long before adopted most aspects of Sumerian culture. Sargon’s conquests helped to spread that culture even farther, beyond the Tigris-Euphrates Valley. Akkadian Empire loosely controlled land from the Mediterranean Coast in the west to present-day Iran in the east. Sargon’s dynasty lasted only about 200 years, after which it declined due to internal fighting, invasions, and a famine. Babylonian Empire In about 2000 B.C., nomadic warriors known as Amorites invaded Mesopotamia. Gradually, the Amorites overwhelmed the Sumerians and established their capital at Babylon, on the Euphrates River. The Babylonian Empire reached its peak during the reign of Hammurabi, from 1792 B.C. to 1750 B.C. Hammurabi’s most enduring legacy is the code of laws he put together. Hammurabi’s Code Hammurabi recognized that a single, uniform code of laws would help to unify the diverse groups within his empire. He collected existing rules, judgments, and laws into the Code of Hammurabi. Hammurabi had the code engraved in stone, and copies were placed all over his empire. laws related to property issues. Additionally, the laws sought to protect women and children from unfair treatment. The laws tell us a great deal about the Mesopotamians’ beliefs and what they valued. frequently applied the principle of retaliation (an eye for an eye and a tooth for a tooth) to punish crimes. if a man was robbed and the thief was not caught, the government was required to compensate the victim. similar pattern of development, rise, and fall was taking place to the west, along the Nile River in Egypt.